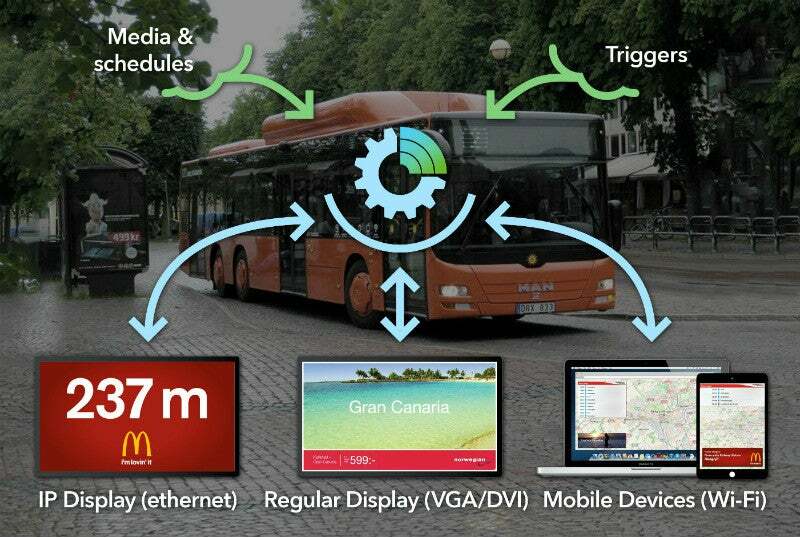 GeoSignage Sverige develops software solutions for infotainment systems and passenger information on public transport. The main product is a content management system (CMS) that enables public transport companies to manage digital signage, including on-board displays and passengers’ mobile devices. In addition to presenting more about the content management system, this page also introduces the company’s Wi-Fi portal, next stop announcement system, and media player hardware. GeoSignage CMS offers transport authorities and operators a simple way to centralise the control of all digital signage displays, and to separate the hardware and software of an infotainment system. The CMS provides powerful tools for distributing location-based passenger information, entertainment and advertising. The major parts of the CMS are the user interface (UI) and the on-board application. The UI is web-based and offers easy-to-use tools for content management and playback analysis (proof-of-play). The on-board application stores all media locally and selects the media to play in real-time, depending on parameters such as time and location. This can be shown on any screen type using a generic protocol. The on-board application is hardware agnostic, and can be placed on a router / gateway or any other shared resource. GeoSignage CMS can be easily integrated with any hardware. Using GPS and line information, the on-board application provides infotainment at the right time and place. The CMS makes it easy to schedule location-based passenger information and advertising, as well as media objects to play at specific events, such as when arriving or leaving an area or stop. With the map tool, the administrator can create geo-fences that are used for triggering playlists, and different playlists can be active in different areas or lines. The CMS can also be used for in-vehicle and station Wi-Fi portals, providing passengers with ‘bring your own device’ (BYOD) capability, and choosing the information and entertainment they want to see. GeoSignage can provide a complete portal design, or set up the CMS to control selected parts of an existing third party solution. Views and clicks are tracked, providing great opportunities to advertise using the Wi-Fi portal. For public transport companies that do not have passenger information feeds available, GeoSignage can provide a lightweight next stop announcement system. It is based on GPS and line / route information, and integrates with the CMS to display the next stop on infotainment displays and Wi-Fi portals. While many infotainment displays come with embedded computers, and GeoSignage CMS is compatible with both ARM and x86 boards, some customers may want or need to have a standalone media server. GeoSignage can offer an affordable media server that is suitable for retrofit, and can withstand the harsh electrical environment of public transport vehicles. GeoSignage is always looking to cooperate with complementing partners, whether as a general OEM supplier or as a subcontractor in specific projects. With experience integrating and interfacing with third party systems, GeoSignage software is built to be modular and reliable. By partnering with GeoSignage, solution providers and system integrators can expand the scope of potential business opportunities and upsell new functionality to existing customers. A video showcasing Geosignage's content management system. This video demonstrates Geosignage's location-based infotainment.